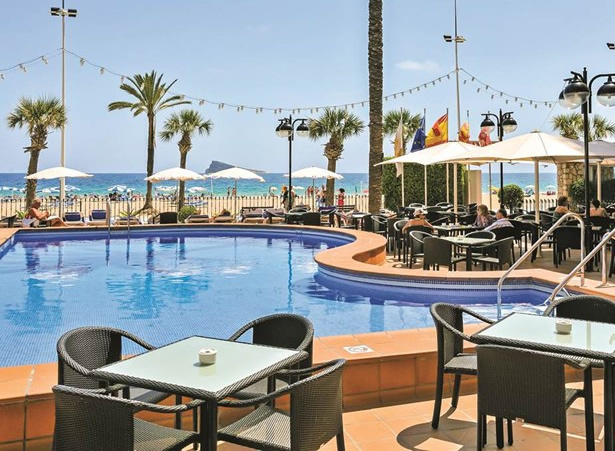 The elegant 4 star Sol Costa Blanca hotel has a prime location right on the magnificent Levante beach in the shopping and entertainment heart of Benidorm. The hotel is an adults only hotel (over 15 years of age) and is ideal setting for a relaxing holiday with your partner in its exclusive atmosphere with fantastic sea views. 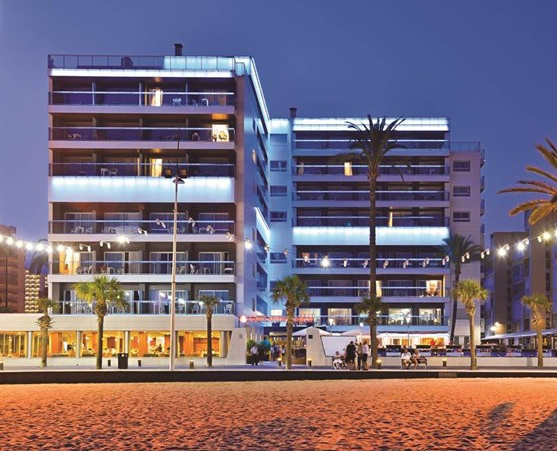 There is exclusive parking for guests, bus stop and taxi rank is only 50 metres from the hotel and Alicante airport is 58 kilometres away. 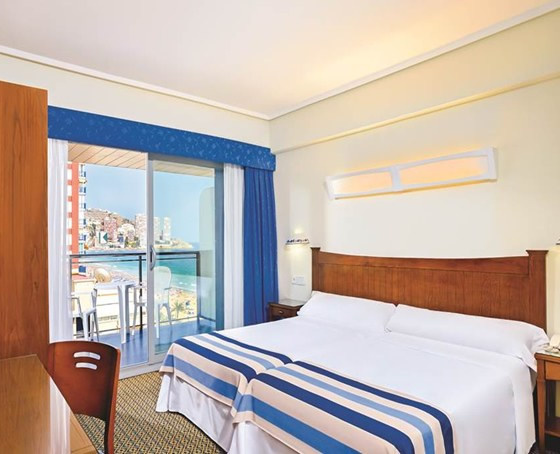 The Sol Costa Blanca features 185 guest rooms decorated in an elegant, classical style in blue and white, the majority have stunning views of Levante beach. Rooms are well equipped with two single beds, flat screen 32 inch LCD TV, individually controlled air-conditioning / heating, functional work space with Wi-Fi internet and laptop sockett, mini-bar, safety deposit box and fully equipped bathroom. 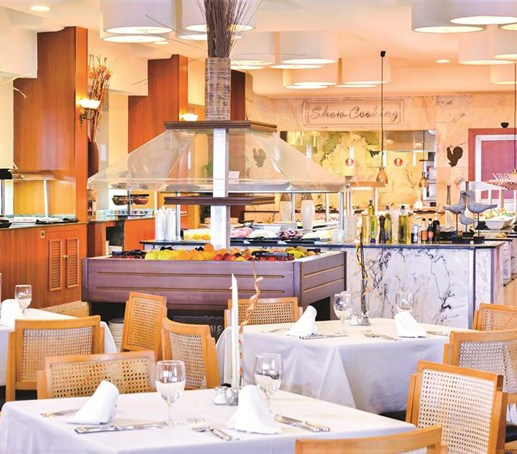 The hotel has a fine reputation for the standard of its cuisine, you can choose from the extensive buffet with two different areas: one with 'show cooking' where you can enjoy the chefs cooking the meal in front of you and a wide and varied selection of products and international cuisine that provides guests with a wide choice of dises and desserts. The hotel has a special dinner on Saturday nights in the restaurant or on the terrace, weather permitting. Vegetarian and menus for celiacs are available, as well as a diet corner please inform the receptionist on arrival. 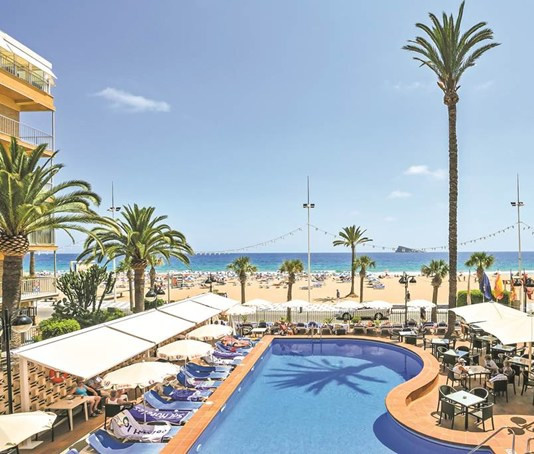 The Sol Costablanca hotel's animation team organizes daily daytime and evening entertainment with live music, Sports, games and activities, Relax by the outdoor swimming pool on the pleasant sun terrace with loungers and parasols, there is a TV room, show lounge with dancing and live music in the evenings. The hotel has a 24 hour reception with high speed WiFi internet throughout the hotel(*), Internet corner(*), Private security throughout the hotel, Medical services a few minutes from the hotel (on request)(*), Laundry and ironing service (*), Pool towel service with deposit, Car rental is available you can also book your car before departure - please ask for a quote (*) , Currency exchange (*) Taxi booking service (*) Private parking for the exclusive use of guests with 49 spaces (*). - (*) With Charge.